Our hearts are throbbing for . . . The Vintage Village Valentino Fair! When? : Sunday 10th February 2013, 10.00 am to 4.00 pm. Where? : Stockport's historic Covered Market Hall, SK1 1EU. Only four days before Valentine's Day, our Valentino Fair is perfectly timed to find that ideal little love token for your dearest heart. You'll be spoilt for choice with the awe-inspiring plethora of authentic vintage treasures crammed into Stockport's delightful Market Hall. There's clothing and accessories for ladies and gents, jewellery, homeware, decor, furniture, luggage, textiles, collectables, curiosities and judiciously selected locally handmade crafts with a vintage flavour. And who better to be our icon of romance than the original 1920s super mega heart throb Rudolph Valentino? 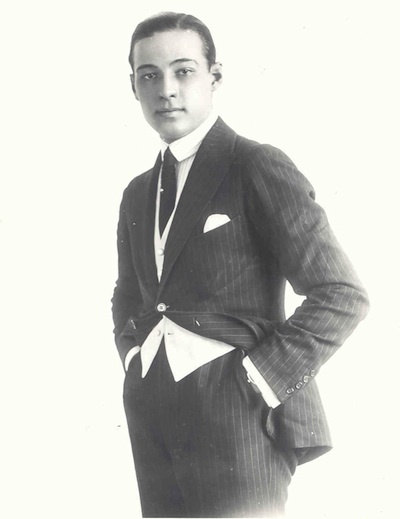 The first 'Latin lover' of the silver screen, Valentino entranced a whole generation of female movie-goers from 1921 - in his breakthrough role in The Four Horsemen of the Apocalypse - until his untimely death in 1926 at the age of 31. You can see for yourself if Valentino's romantic appeal has survived the 90 odd years since his rise to fame in our mini-cinema downstairs in the Produce Hall, which is directly opposite the Market Hall, where you can enjoy our . . .
Rudolph Valentino and Agnes Ayres. Valentino's defining role. Arabian sheik (Valentino) conquers feisty British Lady (Ayres). Rudolph Valentino, Nita Naldi and Lila Lee. One of the most successful films of Valentino's career. Lowly born Juan Gallardo (Valentino) becomes one of the greatest matadors in Spain. Although married to his childhood friend Carmen (Lee) he falls for wealthy seductress Doña Sol (Naldi). It doesn't end well . . . I don't need to point out that these films reflect the attitudes of their time and some allowance needs to be made for this! There's exciting developments for our peckish visitors too. Not only do we have the return of The Hot Dog Bike - which will be serving hot dogs and hotpot on Sunday! 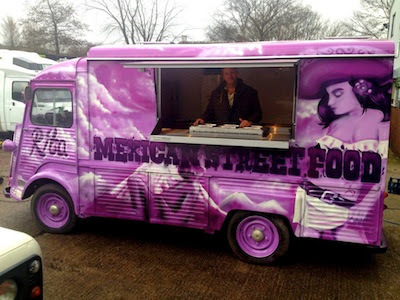 - but we're honoured to welcome Margo & Rita, purveyors of freshly-prepared authentic Mexican street food from their customised vintage Citroen H van (called Rita). Renowned for their burritos, which means 'little donkey' in Spanish, Margo & Rita donate 30p of every burrito sold to The Donkey Sanctuary - isn't that lovely? All your favourite cupcakes and some new ones including our Valentine's Collection: Tiramisu, Rolo, Turkish Delight and Chocolate Raspberry. We will also have Lavender cupcakes and Maple Syrup Pancake cupcakes. And of course our Bakers Dozen vote winner Creme Egg! If you would like to reserve anything to collect on the day please let us know! NEW! Aspidistra - vintage homeware, ceramics, glass and textiles. Bathing Beauty - the best handmade, synthetic-free bath and skincare. Cyprys Vintage & Collectables - vintage clothing, jewellery, kitchenalia and collectables. Funky Koval - vintage Eastern European homeware. NEW! jamessharpart - hand printed textile collage affixed to books, aprons, bags etc. JL Vintage - vintage women's wear, costume jewellery, homeware. Justjewels4u2 - vintage costume jewellery with an amazing selection of genuine Lea Stein; sewing related items and haberdashery. NEW! Maggie Mae's Vintage - vintage homeware, clothing and accessories 1920s-60s. NEW! Magnifique Boutique - vintage clothing and accessories 30s-80s; some vintage homeware. NEW! Memories are Made of These - 1960s-70s homeware. NEW! Phil's Records - 50s-70s vinyl records and pop memorabilia. 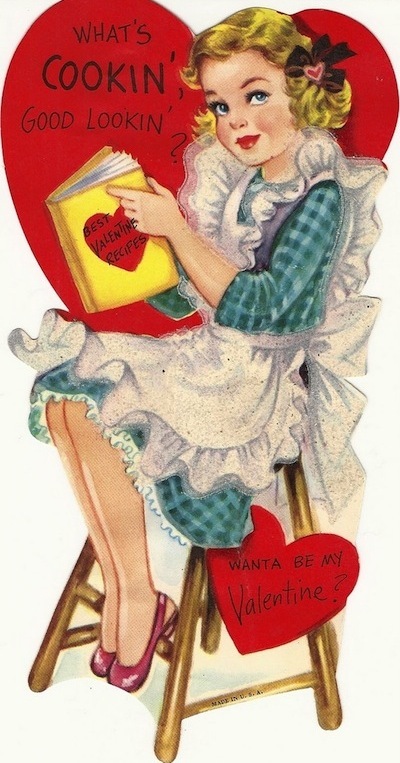 1940s Valentine card combining two of our favourite things - vintage glamour and food! Source. Our icon of romance, Rudolph Valentino. Source. Rudolph Valentino and Agnes Ayres in The Sheik. This picture is crying out for a witty caption! Source. Margo & Rita's amazing brand new custom paint job. Don't miss their very first public outing at The Valentino Fair! 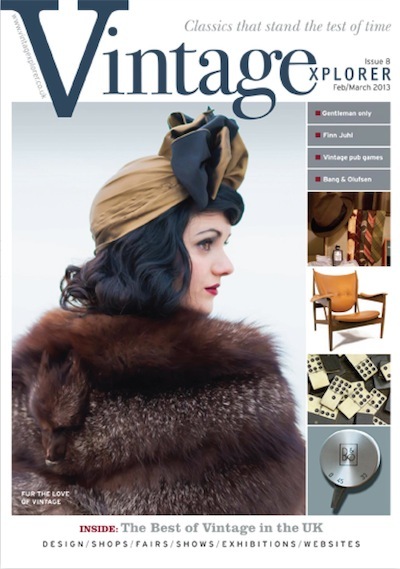 We've just received the new Feb/Mar issue of Vintagexplorer. Pick up your FREE copy at Room at the Top Vintage Goods this Sunday! NEW! Retrorags106 - vintage men's and women's wear, bags, homeware. retrospektiv studio - vintage objet d'art. NEW! Rita Machin - vintage glassware, ceramics, small furniture, costume jewellery, books 1950s-70s. Silver Hammer - vintage women's clothing 1960s-80s. NEW! Stock Vintage - vintage men's and women's clothing, and some homeware 1950s-80s. NEW! The Knick Knackery - vintage women's clothing 1940s-70s, mostly mid-century bric-a-brac and homeware; records and vinyl paraphernalia 1950s-80s. The Magical Tree Vintage & Retro - vintage men's and women's clothing and accessories 1940s-80s. Tracey's Treasures - vintage pearl and glass necklaces. Violets For Your Furs - vintage jewellery and collectables. NEW! Walthew House - remade vintage jewellery, raising funds for Walthew House. Wax Delerium - vintage vinyl. NEW! Wendy's Vintage - vintage women's clothing 1970s-80s.